Tonight was a real treat with Presto showing us their new ‘on’demand’ TV and movie service and Amaysim making a welcome return with their new 4G and data plan offerings. First up Richard Cole was on stage from Presto. Presto is one of the new online, on-demand video content providers and Richard kicked off the discussion with a look at what we should expect from an on-demand service, starting with speed. Presto would like its subscribers to have the same experience as watching a normal TV broadcast. To achieve this Presto has eight different streams and serves them up based on the speed available to your modem. It’s an adaptive rate streaming system and monitors the download speed of your connection. By sampling the speed every 15 seconds it can adjust the rate to meet sudden load demands on your connection. This should maintain that smooth “TV broadcast” like experience. Replying to a question from the audience, Richard told us that a high definition movie was about 2.5 GB an hour, using standard definition, the bit rate is 1.3 MB per second. Presto on Telstra Home Internet and Foxtel is unmetered, but as was pointed out from the audience, it pays to have an unlimited or large data allowance. Presto can be viewed on iPhones, iPads, Macs, PCs, Android devices and games consoles like Play station, Xbox, and Chrome cast. Richard went on to speak of the challenges in delivering video across this range of devices. He highlighted how good games consoles can be at delivering video as they have a very consistent video code environment. Richard told us how he sold Play Stations to the US military as they were cheaper than servers while delivering the same power in terms of the video quality. 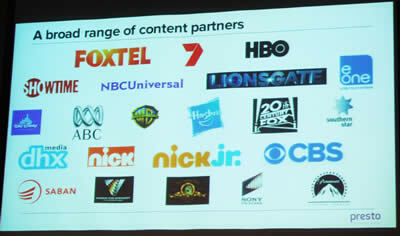 Presto and Telstra have a partnership to deliver on demand content to Telstra customers through the T-Box. 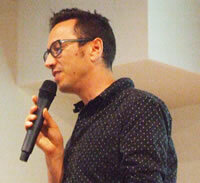 Richard also spoke about plans Telstra and Presto have to deliver a new Telstra TV service. It is an on demand streaming service for TV channels and is based in the Roku media receiver. 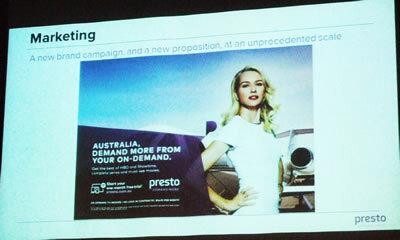 It may have been difficult to miss the new TV ads from Presto, featuring Australian Actor Naomi Watts. Richard played two of them for us. The full package is $14.99 per month for both TV and Movies or $9.99 per month for TV or Movies and no ads. Before we finished, a question was asked on the overall bandwidth needed, and if companies like Presto were pressing the government on the NBN. 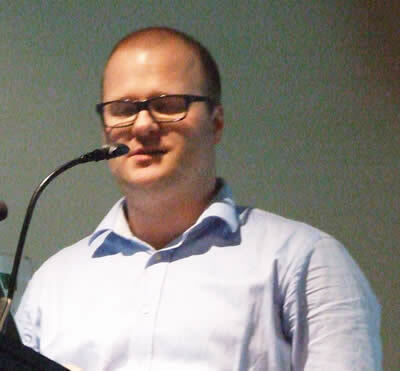 Richard gave us a good insight on the overall delivery of broadband services in Australia. Some regional areas don’t have the bandwidth to show video. The minimum needed is 3 Mb per second with around 7.5 Mb per sec for a high definition video. A rate of 7.5 is fairly common in metro areas. Richard identified two problems, the hardware, (the wires to your home) and the software. The software, in this case the video relies on the compression rate and it’s a juggle between quality and size as these compression rates get better the package gets smaller. Ged Mansour and Natasha McNamara took the stage for Amaysim. and now they have over 700,000 customers and a listing on the Stock Exchange. Amaysim was one of the first Mobile Virtual Network Operators or MVNOs. This means they did not own their own set of poles and wires. In fact Amaysim runs on the Optus network. They can also be known as BYOs as most don’t have stores and don’t sell phones, only access. There are three networks in Australia Telstra, Vodafone and Optus. The big three act as wholesalers of bandwidth on their network and sell access to the network to these MVNOs. 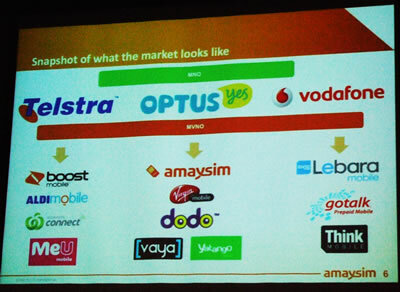 Amaysim is the largest MVNO in the market, making them the fourth largest telco in Australia. When they started, contracts were the market standard, usually locked in for two years and to quote Ged “funny money”, pay $50 per month and get $800 ”. Amaysim really disrupted this idea. They hit the market offering no locking contracts with a “pay as you go” and an all-inclusive “per month” arrangements. The real selling point was the flexibility to change schemes every month as your needs changed. The idea appears to have taken off with most operators offering some form of per month arrangement. 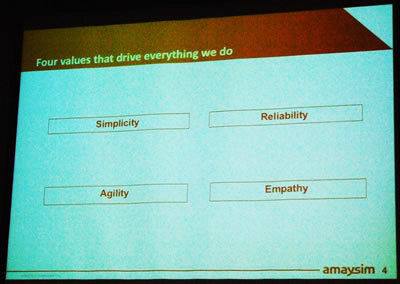 There were four principles behind the business model - Simplicity, Reliability, Agility, and Empathy. This meant easy to understand plans, dependable staff and products, the ability to move quickly if ideas didn’t work, and an understanding of the customer base and their needs. Natasha then gave us a quick overview of the industry. The slide shows us the three wholesalers and the major MVNOs using each network. 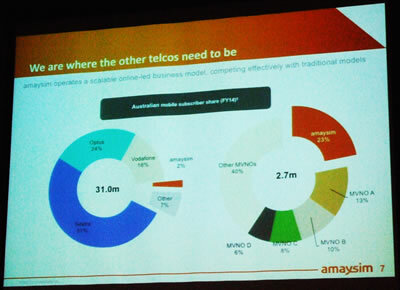 MVNOs only make up about 7% of the overall market share, but Amaysim has 2% of that market. That means that in its own field Amaysim has 23% market share, out-performing all the other MVNOs. Mobile phone use has changed. At its introduction the mobile phone looked like the old “walkie talkies” you would see in war movies and plans were all about talk and text. The smartphone changed that and now it’s all about data. Amaysim has shown the agility Ged spoke about in the changes to its plans - more data and unlimited talk and text. When Rolf visited, Amaysim offered an unlimited plan with 4 GB and a pay as you go with data at 5c per MB. 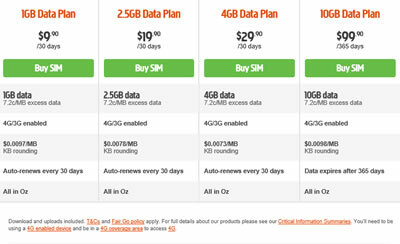 Even then they understood data needs and offered 10 GB over one year at $99. Amaysim have a range of new plans now with loads of data on all of them. 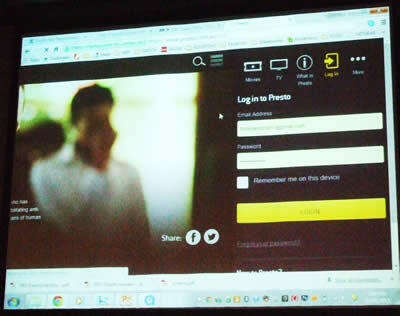 Amaysim is a BYO service so you need your own phone, tablet, or laptop. You can find a sim card at over 7000 retail outlets. They even offer to deliver one in 3 hours or the next day. You can top up by voucher, online, using your Amaysim phone App or simply phone the recharge number. It’s all about having your provider in your pocket. Natasha spoke about how customers are driving the service. 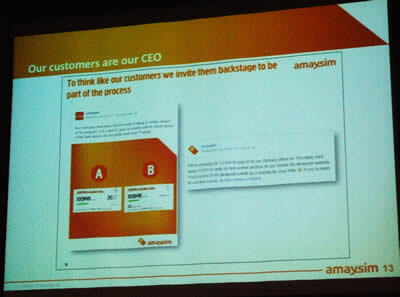 Feedback from social media and customer comments help develop the changing face of Amaysim by allowing the company to respond quickly to changing needs. Amaysim have tried to make talking to them simple, using a traditional call centre, situated in Bridge St. Sydney, while embracing the innovations of live web site chat and social media. Not to forget your phone, the “My Amaysim” phone app allows you to do almost everything including recharging and changing plans as you need. 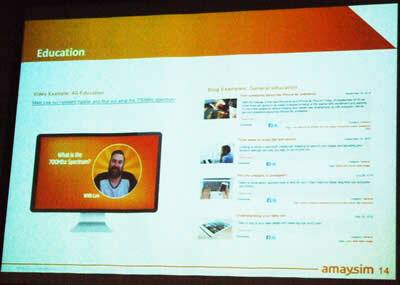 Education is another aspect of the Amaysim support. Ged spoke about informing new customer of the basics of such things as controlling data usage. He gave examples like stopping auto video downloads and when to turn data on or off including how to change programs settings to avoid any background use of data. You can find help on the blog site and they have a Youtube channel. 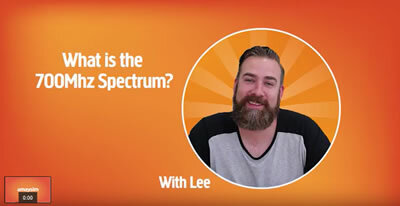 explaining how the mobile spectrum works and the variation between 4G and 3G reception. Tonight we had four great prizes. Richard organized two twelve months subscriptions to Presto and Ged and Natasha provided two Amaysim sim cards with loads of credit. Sydney PC User Group Inc. © 2008 Last updated: Wed. 11 Nov. 2015.